This card is for a challenge on one of my groups. The challenge was to use the new punches or brass templates. I am sending this to SU for the jumbo eyelet/wow contest. Wish me luck I have never sent anything to them before. Man what fun I had with this card. It started out in my head as a tent topper card. I started with a 9 and 1/2 by 4 and 1/4 piece of really rust. I scored at 4 and 1/4 and then at 8 and 1/2 to make it a matchbook fold. Next I trimmed the sides on a slight angle and sponged on really rust ink to make it look like a planter pot. I added a piece of the new ribbon from the Fairy Tale collection across the top just to add a little texture. I punched three scallop circles in bashful blue and cut on the scallops to make flowers. Added a circle of So Saffron and topped with a clear button with natural twine. The leaves are the small oval punch and sage shadow card stock. I attached the flowers and leaves to a square of sage shadow and then added the entire thing as my topper. Now for the fun part. I made these little bookmarks to put inside. The recipient can just tear them out and use them since I perforated them with the cutter kit. This is what they look like when in use. I had to make them a little small to fit in the card but they work. The jumbo eyelet is what stops the paper from coming apart and holds the whole thing together. I have also posted a tutorial for the bookmarks. Don't forget to check out my giveaway on the previous post. 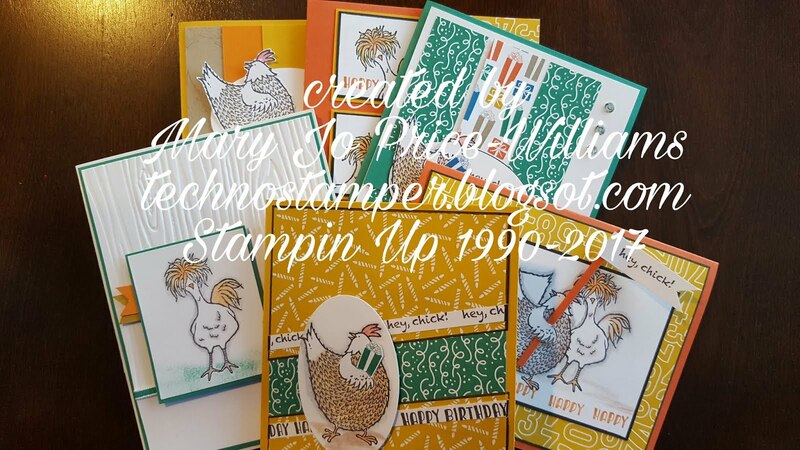 You can win a $25 gift certificate for Stampin Up! merchandise of your choice. Here are the cutest and easiest bookmarks. I hope you enjoy them as much as I enjoyed creating them. Start with a strip of card stock 1 and 1/2 inches wide by what ever length you want. Mine are a bit short because they needed to fit in the card in the post above this one. Slide the card stock into your punch from the bottom as shown in this picture. You may need to use the tip of your scissors or some other object to help align it correctly. Make sure your paper is straight and just punch the top. This is what your strip will look like when you are done. Adhere a very small amount of adhesive to the very top of a scallop circle. (as a side note it may be easier to put it on the top of your strip so you know your scallops will line up and there will not be adhesive below the eyelet). Do not put adhesive on entire thing -- you just want to hold it in place while your attach the jumbo eyelet. Line up your punched out scallop with the top of your strip and attach. Use your Crop-A-Dile to punch a hole in the center of your scallop flower. (notice I added a circle to the center of mine before doing this). Add a jumbo eyelet to the center. Set your eyelet with your Crop-A-Dile. You can of course use a regular any where hole punch and eyelet setting tool too, but I love my Crop-A-Dile! Now wasn't that soooooo simple? They look really cute in a book and stay put thanks to the eyelet. What? No one is interested in winning a $25 gift certificate to use on Stampin Up! stuff! Or are you all busy stamping and creating? I hope so, I would "hate" to have to spend it myself. Hmmm, maybe I don't want any posts after all. Tee Hee. Purely Pomegranate and River Rock. I really like these two colors together. This card is actually very simple but really looks nice in person. I think it is the type of fold that gets me. I use this fold a lot. Ink colors used: Pomegranate and Sahara Sand. Other: paper piercer and misc. brad. Quick and simple. This was one of last months cards for my SU parties/workshops at other people's homes. 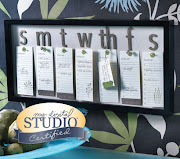 How would you like to win a $25 gift certificate from Stampin Up! (aka -- me)? 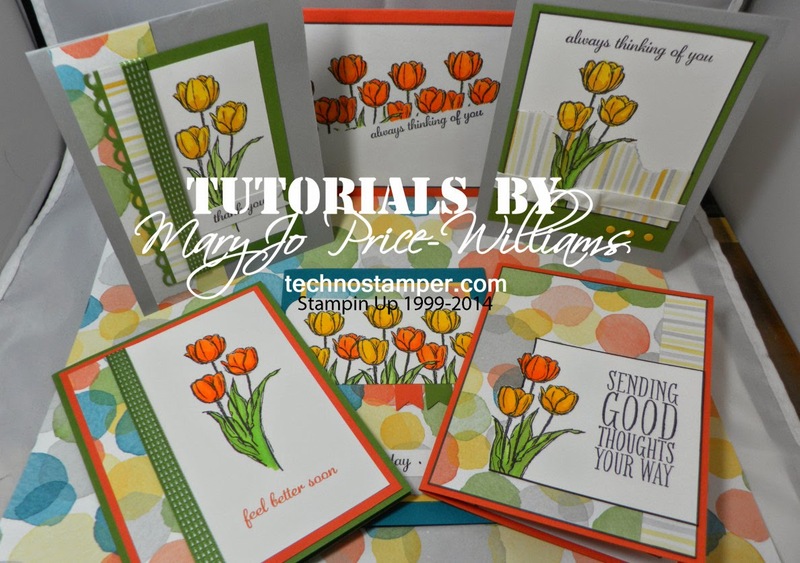 We can all use more supplies, especially stamps so I will let you spend it as you choose. Want to know how to win? (Of course you do.) Here is what you need to do. 1. Create a card using the new technique that I posted yesterday. 2. Post a comment on this post telling me where I can see your sample. 3. Cross your fingers and hope that you are chosen from the random number website. You will have until Sunday, September 2nd at 12am EST to post your comment and card. I will pick a winner and let you know on Monday morning. Good luck and have fun. Here is another card with the previous technique. 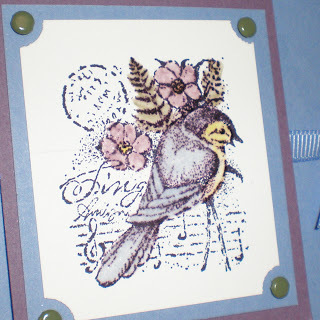 For this one I used pretty in pink for the A2 sized card stock. The tissue paper is stamped with Well Worn Words in Regal Rose. I then Layered it on Rose Red and then back to Regal Rose. Other items used: hodgepodge hardware and rhinestone brads . 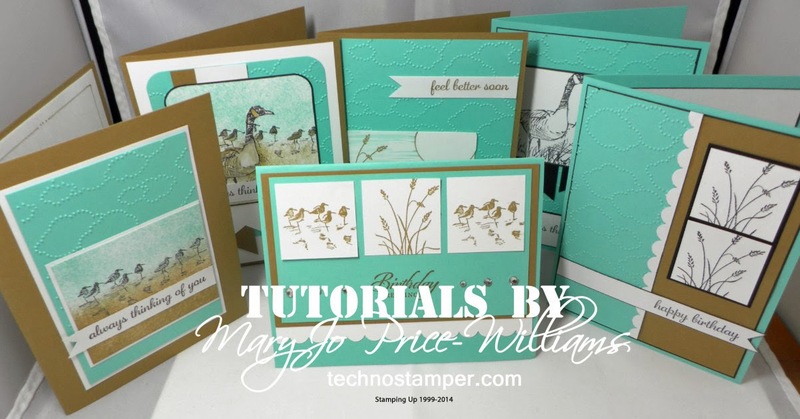 Watch this blog for a contest where you can win something great by posting a sample of this technique! 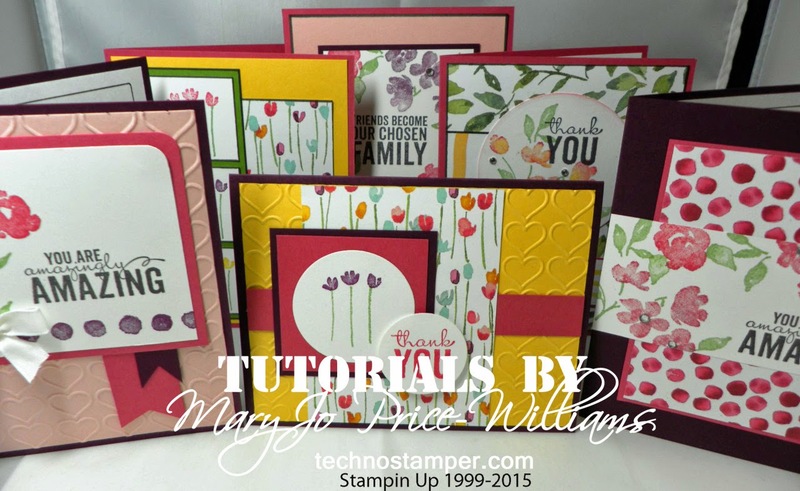 Go on and get stamping! Many years ago I saw a technique similar to this in a magazine. This is not the exact technique but my rendition since I have long ago discarded that magazine. I am not sure what to call the technique. Maybe MJ's surprise? Whatever you call it it is a great way to use chip board pieces. In my samples I used my Sizzix machine and cut from cardboard. I plan to do a contest with this technique soon so get your samples ready! I hope you enjoyed my first tutorial. Keep your eye out for that contest. This card was for a swap for a group that I belong to. I started this about 2 1/2 weeks before it was due. That is amazing for me, since I do EVERYTHING last minute. So it was 2 1/2 weeks before it is due and I have all the pieces cut, stamped and ready to assemble. I decide I will finish at another time and guess what.....I completly forgot about it until two nights before it is due. Man that stinks, so I hurry up and put them together during a club meeting while my customers are working on their projects so I can overnight them to the hostess. The good news is that I got them done! The bad news is that I packed them in the box with the other supplies from the class and forgot all about them again! Lesson learned....don't ever start your swaps too early, lol. This card uses the new in colors for this year. Soft Sky is used for the base. I then used my paper piercer to add to the top right corner of a 5 and 1/4 x 4 piece of Blue Bayou . Next I used the prints designer series paper in Soft Sky, I used both sides of the paper since it it two sided. One pieces is 3 and 3/4 by 3 and 3/4 and the strip is 3 and 3/4 by 1 and 1/2. On the thin piece at the bottom I used the slit punch to do the scallops and then the Crop-A-Dile to put the holes in the scallops. The greeting is from the new Hugs and Wishes set and is stamped in black along with the lady bugs from the Whimsy Set on the larger piece. The new scallop punch was used on Barely Banana to make the fist layer of the main image followed by a circle of soft sky and then whisper white. I used our markers on the tulip from the Whimsy set. Barely Banana on the flower with Apricot Appeal on the detail lines and Certainly Celery for the stem. Last but not least our new rick rack ribbon was added under the main image. Hope you enjoy. I need to RAK a few people from that list with these. Oh, to find more time in a day--hope you have a great one! One of my favorite things about stamping is the wonderfully creative people who see things as they really are not! This is a sunflower stamp from the Serene Sunflower Set. A friend of mine Toni from Toni's Adventures in Stamping made a card the other day using this as a wreath. I did not see it on her blog but there are other cards on there using this as a sunflower that are worth checking out. Anyway, I thought it was brilliant and decided to make one myself. My version uses Old Olive for the card base. I then made my next layer with Real Red. I wheeled the new Whimsy wheel in Real Red on the layer before I did faux stitching around the edges. Then I embossed the Merry Christmas from Many Merry Messages in white. The main image is stamped on Whisper White with Old Olive three or four times only re-inking once to get different generations of the color for depth. I used red sticklers for the holly and a small red piece of ribbon for the bow. This is then mounted on a square of Real Red and then to more Whisper White with five red brads to add weight to left side. It is my favorite Christmas card so far this year! Of course if you recall, it is my first so this will probably change. I am usually drawn to the bold red and white Christmas cards though. 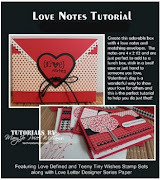 class is only $13 (must bring your own adhesive) and we also make two cards using the technique. We have been doing this for 14 months now (I think) and it has been a lot of fun. I will try to showcase some of the older ones in later posts. This month's technique was watercolor embossing. I have to admit I got this idea from Connie Babbert. She even used the same stamp set. It can also be found in the Technique Junkie Newsletter that is put out by Pat Huntoon. I already warned you that I love this set and the bird is just sooo cute. As a tip to any of you trying this technique -- it also works with chalks! I did the bird card with chalks since I only have pastel crayons. 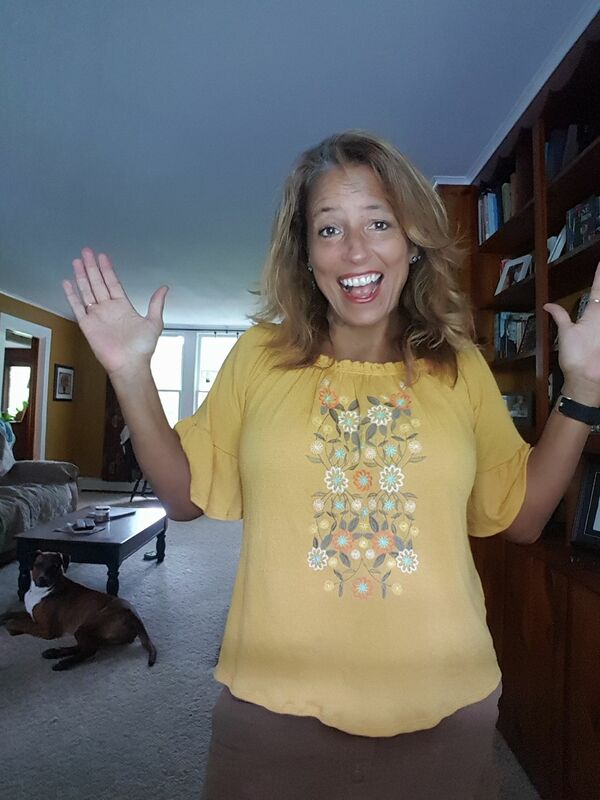 It worked perfect and was just what I wanted - bold colors. The next card is done with the retired set Garden Collage. I thought this was a great set to show off the technique since I was able to only emboss a section of it and leave the rest plain. I tried to show it at a different angle for you in the second up close picture but not sure you will get the true effect. This technique is quick, easy and a definite WOW! I was surprised I liked it as much as I did. 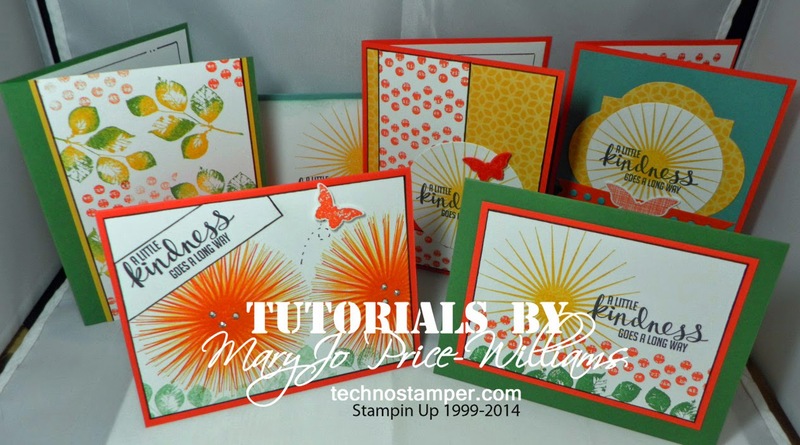 Technique Supplies Needed: Coloring book stamps, permanent black ink, versamarker, watercolor crayons, clear embossing powder, heat gun and white or light colored card stock. Technique Directions: Stamp image on card stock using permanent black ink. Use vesamarker to pick up color from watercolor crayons. Color image as desired. You may need more than one coat to get the color you desire. Clean versamarker on scrap paper between colors. 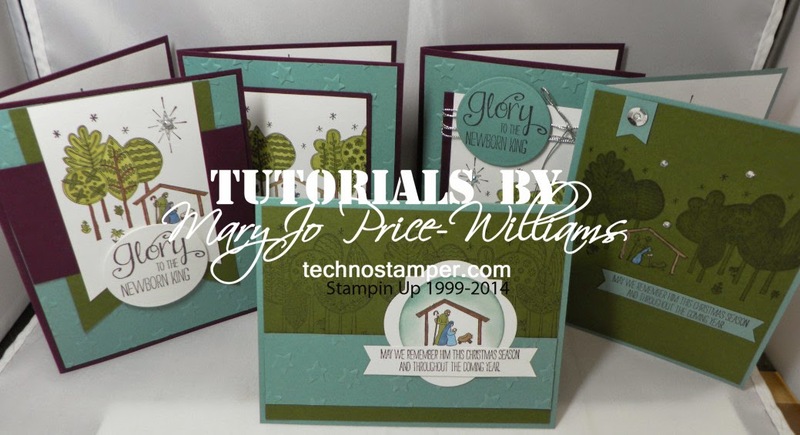 Cover entire image with clear embossing powder and emboss. Embellish and add to final project. Have fun creating and share your work if you would! One more of these toppers for today. This one uses the set Carte Postale and the retired Chocolate paper. These are both simple cards that were used at one of my All Occasions classes. 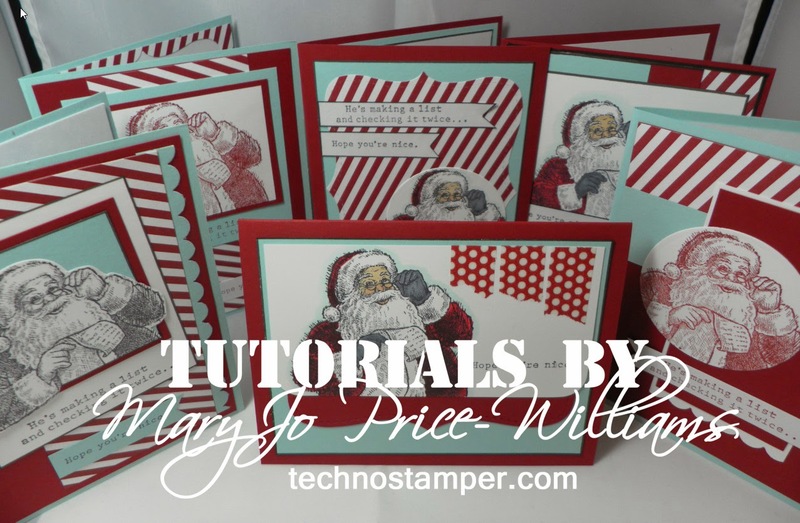 These cards are so fun to make and easy too! I am sure you have already made some but if you haven't go ahead and give it a try. Careful they can be addicting! I had just fallen back in love with the set Nice and Easy Notes right before they retired it. Go figure! I had to wipe off a couple years of dust to use it before retirement.